Our Community. Our Children. Our Responsibility. In less than a week some of our children will be lugging trunks to board buses. Others will get up early to wait to be picked up for their first day of their daily ride. A few months ago, they registered for this moment and cannot wait another minute. 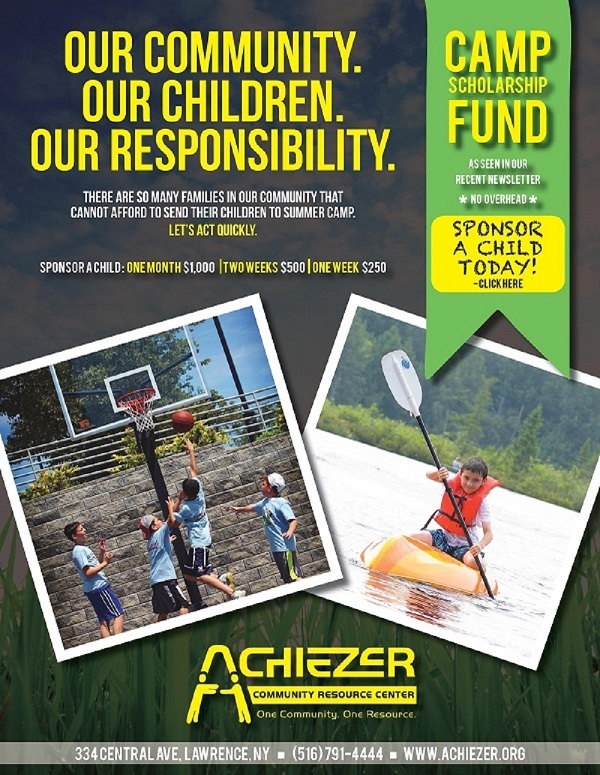 Unfortunately, this year, for many kids in the neighborhood, camp is just a pipe dream this year. They can't join the conversation of counselors, canteen, or color war break-out. Thus far the JCCRP, Davis Memorial Fund and the Leon Leif Camp Fund, headed by the indefatigable Dr. Debbie Dienstag, have worked tirelessly to raise the funds needed to get everyone into camp. But the community has grown, family budgets are strapped and the need for camp has not waned. We can't stop now. Everyone must do their part. It hurts to write this email. One mother just left our office, and as of this moment her children will be spending the summer at home. Dozens of parents need to tell their children that camp is not an option. In less than a week, what promises to be an exciting two months for some will be dreadful eight weeks for their young friends. Surely you receive hundreds of letters a year asking to help a cause. But the need is for right now. Send something. Anything. Because, collectively, if everyone makes a donation, everyone will make it into camp. There are no overhead costs associated with this campaign. Every request has been vetted with utmost discretion and integrity. Whether it's $100, $250, $500 or even $1,000, your kind response to this one single email will truly make a difference for a child and a family in OUR own community. Please respond NOW. The deadline is quickly approaching.